Clarence Linden Garnett Ashby III (born May 23, 1960) is an American actor and martial artist . He is known for his roles as Johnny Cage in the film adaptation of Mortal Kombat, and as Dr. Brett Cooper on Melrose Place. He is also known for his role as Sheriff Noah Stilinski in the MTV series Teen Wolf (2011-2017). Ashby was born in Atlantic Beach, Florida, the son of Eleanor (Johnson), a civic organizer, and Clarence Linden Garnett Ashby Jr., a pharmaceuticals manufacturer. Ashby graduated from The Bolles School, a private school located in Jacksonville, Florida. He attended Fort Lewis College in Durango, Colorado, but dropped out his junior year to pursue an acting career. Ashby studied acting at Neighborhood Playhouse in New York City. Ashby's first role on television, in 1985, was on the ABC soap opera Loving, where he was the second actor to play the role of Curtis Alden. Soon after, he was cast as Lance Reventlow, the only son of Woolworth heiress Barbara Hutton (played by Farrah Fawcett) in the Golden Globe-winning miniseries Poor Little Rich Girl: The Barbara Hutton Story. In the spring of 1997, Ashby starred in the short-lived ABC drama Spy Game. Later that year, he joined the main cast of Melrose Place as Dr. Brett Cooper, a role he had until the start of the seventh season in late 1998. He first appeared on the show in the first season in 1993 as Jo Reynolds's estranged husband Charles, in the episodes "Peanut Butter and Jealousy" and "Single White Sister". He was in the movie Wyatt Earp where he played Morgan Earp, Wyatt Earp's (Kevin Costner) younger brother. He played Cameron Kirsten on The Young and the Restless from 2003 to 2004. He also began playing the role of Paul Hollingsworth on Days of Our Lives in March 2008. Ashby also portrayed Beacon Hills’ Sheriff and father to Stiles Stilinski (played by Dylan O'Brien) on MTV’s Teen Wolf series. Ashby is married to actress Susan Walters. The couple met on the set of Loving in 1983, where she was a regular and he was filming a guest appearance (he would later become a regular cast member in 1985). They have two daughters, Frances Grace (born 1991) and Savannah Elizabeth (born 1992). Ashby has been a student of martial arts on and off since he was 21 and studied Karate, Tae Kwon Do and Kung Fu. Linden has admitted to previously suffering panic attacks before auditions which threatened to shorten his career. 1992 Inside Out III Jerry Van Anthony Segment: "Tang Martin Hudson"
1987 1st & Ten Episode: "Blood on Blood"
1987 Werewolf Victim #2 in VW Episode: "Werewolf"
1989 China Beach Phillip Episode: "The World: Part 2"
1990 Hardball Episode: "A Killer Date"
1990 MacGyver Brett Reynolds Episode: "Twenty Questions"
1991 Equal Justice Charles Episode: "Sleeping with the Enemy"
1993 Melrose Place Charles Reynolds Episodes: "Single White Sister", "Peanut Butter and Jealousy"
1998 Love Boat: The Next Wave Lt. Joe Spenser Episode: "Bermuda Triangle Episode"
2001 The Agency Episode: "A Slight Case of Anthrax"
2002 CSI: Crime Scene Investigation Det. 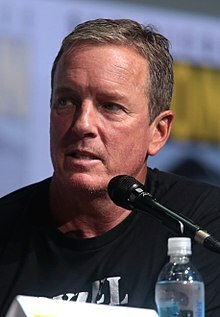 Drew Wolf Episode: "A Little Murder"
2005 CSI: Miami Steven Hardy Episode: "Three-Way"
2005, 2007 Eyes Michael Tobin Episodes: "Shots", "Police"
2009 Drop Dead Diva Parker Wellner Episode: "Pilot"
2011 Franklin & Bash Evan Porter Episode: "Pilot"
^ a b "Linden Ashby Biography (1960–)". Filmreference.com. Retrieved 2017-05-26. ^ "Garnett Ashby". Florida Times-Union. May 15, 2010. Retrieved 2017-05-26 – via Legacy.com. This page was last edited on 9 April 2019, at 12:55 (UTC).